ATAK OF SEVKET was imported from TURKEY into the UK by Mr John Lloyd in 1968. ELIEF OF HAFIK, Atak's half sister who was also imported from Turkey to the UK to the USA, was mated to Atak. They were both sired by IT OF SEVKET. Another half sister of Atak of Sevket Sired by It of Sevket was Elief of Hafik's litter sister, YILDIZ OF HAFIK, Elief of Hafik's litter sister and therefore a half sister to Atak of Sevket, was also imported from Turkey to the UK to the USA. 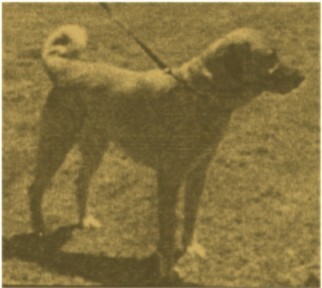 Natalka Czartoryska's records (provided by Caroline Southen) show that Atak sired at least one litter with Yildiz in the USA. One of these pups was CHAMPION Bekci (USA). Yildiz whelped several tricolour pups, including a famous tricolour male, CHOMAR, who was a big show winner and made television appearances (taking this from Natalka's records - IF YOU KNOW MORE ABOUT THIS CHOMAR I'D LOVE TO HEAR ABOUT HIM.). Atak, Eleif and Yildiz are recorded as having the same Turkish sire, 'It of Sevket.' While Eleif and Yildiz were full sisters, Atak has a different dam recorded.